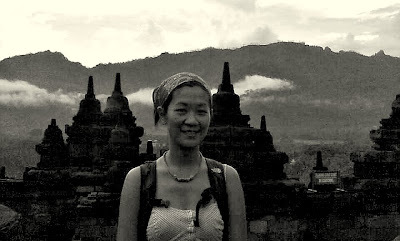 I refused to leave Yogyakarta without seeing the Temple of Borobudur. We were supposed to see this yesterday but we lost track of time and the temple closes at 5pm. I ended up booking a flight to Bali instead of taking the land route via Bromo. I kind of regret that now, I didn’t need so much time in Bali, but oh well, it’s like that when you travel, sometimes you’ve to make quick decisions and live with it. Ayu, my dearest host, came with me. But getting to the temple is easy, any tourist can get there by taking the bus from the Umbulharjo station all the way to the monument. The ride takes about an hour. The Prambanan incident fresh in my mind, I told Ayu I was willing to pay the tourist price of $15. She went to buy tickets and came back with 2 local tickets ($1.5), ha ha! Fine, let’s try it one more time! This day being Sunday, the temple was crowded! And it was raining hard too with not so much covered area. We casually walked through the entrance but both our hearts were pounding like mad. And we made it! Even if I was dressed like a tourist more than ever! 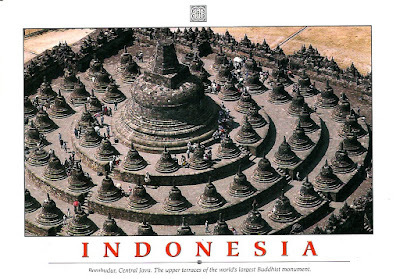 Borobudur is one of the largest temple constructed outside of India. With its vast size, it curiously existed hundreds of years abandoned and forgotten. It was rediscovered sometime in the 1800s and restoration began in early 1900s. Much has been discovered since the restoration program with the help of international technical and financial aid, but much more remained a mystery like who ordered the building of this huge temple of worship? and when? The scientific estimate is sometime in 700-800AD. A temple of this size, in those days, needed a lot of man power and several generations to erect. There should be a whole village around it. Why did everyone leave? Why isn’t there a hint of an old town? And up to this day, with all the modern digging, drilling, and studies, they couldn’t find the quarry where the huge amount of (55,000 cubic meter) stone were taken from. Crazy right? Hollywood should come and make some Tomb Raider/Indianna Jones type of movie here. The plan (top view) of the temple is organized in 4 levels of square(ish) outer wall, then 4 levels of circular terrace, and then a main candi (temple) at the top (and center). The stone walls bear intricate carvings telling about the life journey of Gautama Buddha and other Buddist teachings like suffering and denouncing of desires. So did I not say I looked like a tourist? There were hundreds of elementary students asking to interview foreigners to practice speaking in English. I knew about locals having photos taken with Caucasians, but I’m not a bule yet still get asked to be photographed. This was the first group who approached me at the 2nd or 3rd level of the temple. I had to say no to the rest of them because I wanted to finish the temple as I have a plane to catch that night. This is at the top of the temple. The children were trying to reach the hand of the Buddha inside this stupa. It is said to bring good luck. Actually I should have gone rubbing the Buddha myself to appease them, for as I was at the last level and taking photo of this major stupa at the center and peak of the temple, my beloved Canon G9 stopped working. It just died, like that. For this trip, I brought an extra 16G of SD to make sure I don’t run out of memory and fear SD malfunctioning, as it happens. I also have an extra battery because sometimes G9 doesn’t last the whole day with heavy usage. But I didn’t plan for my camera breaking. It was less than a year old and I’ve taken it with me everywhere (underwater included) an had never failed. Until now. While I’m traveling alone and have no friend or sister with me with backup camera. 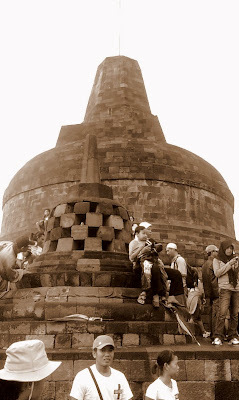 So at the best site to have your photo taken at the peak of Borobudur temple, mine was taken with a Nokia cellphone! No, I don’t look too happy. I was depressed actually. And immediately what came to my mind was…karma! How freaking immediate! I cheated the temple with the entrance fee and my camera broke! And I still have a full week in Bali ahead. aaaaw, i'm sorry to hear about your camera malfunction! to have that happen in this majestic, mystical destination is just too devastating! Hi Andy. Lol@waiting for the "karma". It happened to me once before in France, at Mont Saint Michel. I think my cameras are not happy going to places of worship. he he. Indonesia is amazing, you should visit too, maybe same trip as your Philippines. :) No, I won't be buying camera during the trip. Wow, I was wondering when "karma" would come into the story! That's really powerful. I am so sad to hear about your camera though, where it was karma related or not. That's happened several times to me actually. Will you buy another camera while in Bali? This place looks amazig, by the way. I sure hope I get to visit it some day!